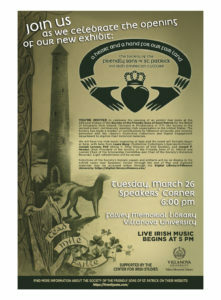 Villanova University invites members and guests of the Friendly Sons of Saint Patrick to celebrate their digitization of our Society’s archives. The exhibit, “The Society of the Friendly Sons of St. Patrick and Irish American Culture,” will be held in the Speakers’ Corner of Falvey Library and will feature and display many historical documents highlighting the rich history of our organization, as well as a collection of artifacts from the McGarrity Collection. Refreshments will be available and music will begin at 5 pm. There is no cost to attend this event, but advanced registration is requested. We are also able to provide a limited number of parking passes for the M-2 garage, which is much closer to the library, for those who have mobility issues. If you would like to request a parking pass for the M-2 garage, please email Gina Duffy, Library Events and Program Coordinator, at regina.duffy@villanova.edu. For general questions about the event, please email Laura Bang, Distinctive Collections Librarian/Archivist, at laura.bang@villanova.edu.